This marks the first time a surgeon’s pit at a Civil War battlefield was excavated, a statement from the National Park Service said. 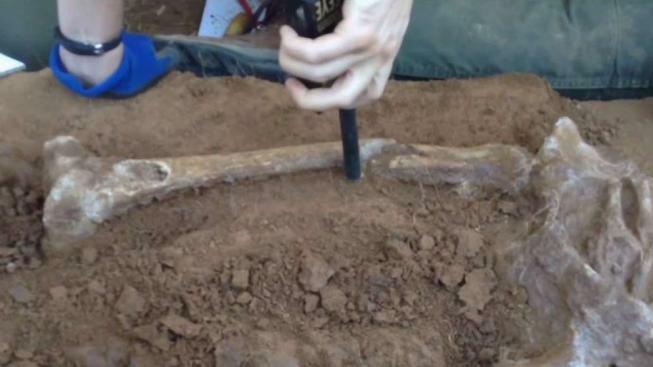 'Incredible Find': Remains of Civil War Soldiers Found in Va.
More than 150 years after the end of the Civil War, researchers have identified the remains of two soldiers at a excavated battlefield hospital in Manassas, Virginia. The battlefield surgeon’s pit in what is now Manassas National Battlefield Park was excavated in 2014. On Tuesday, the National Park Service Honor Guard provided a color guard as the soldiers' remains were transferred to the Army. The National Park Service and forensic anthropologists with the Smithsonian's National Museum of Natural History determined the soldiers were white men age 25 to 34 who died on injuries received in the Second Battle of Manassas. One of the soldiers still had a bullet lodged in his upper thigh. The other soldier had three gunshot wounds. According to the researchers, the men likely had injuries so severe that they could not be saved. Forensic anthrologist Douglas Owsley said he was honored to contribute to Civil War history. "The harrowing stories of Civil War soldiers and the surgeons who tended to them are traced in the remains and bones of these men,” Owsley said in a statement. "We’re humbled by the opportunity to give voice to their story, and we are in awe of the bravery and tenacity these men showed in the face of war." This marks the first time a surgeon’s pit at a Civil War battlefield was excavated, a statement from the National Park Service said. It is also the first time that killed-in-action Civil War soldiers were discovered in an amputated limb burial pit. The men are set to be interred at Arlington National Cemetery this summer.